Many of these concepts were presented at the EPRI Power Quality and Smart Distribution 2010 Conference in Quebec in June of 2010. The public and the governments are mandating that a Smart Grid structure that integrates renewable energy be developed. Their goals are to decrease carbon emissions to the atmosphere, reduce dependence on petroleum (both foreign and domestic), decrease our use of energy and increase energy security for the population. The policy makers do not have a firm grasp of the physical realities of what they are asking of the grid companies. EPRI estimates this Smart Grid will cost $165 Billion and take 20 years to install. So what are we designing, a system for 1.7 kW houses or one for 24 kW houses? A block of 100 houses needs 170 kW average. It has a possible peak of 2.4 MW. Typical load varies between 100 kW and 270 kW. Imagine a world where the houses used a flat 1.7 kW with no dynamics. Imagine a world where Renewable Energy was integrated into every home driving the grid load to a flat 1.2 kW still with no dynamics. There is a driving need for autonomous energy security. The Smart Grid was conceived by people at the top so it is a Top down strategy. To implement this Top Down strategy the information at the local level has to be minimized. Minimizing the information locally means the system can never be very smart locally and so has to depend on the Control center making real time master decisions. Real time decisions involve detailed data being sent all the way to the central control center and then back to each device. This idea depends on an extremely complicated high speed communications network that is a combination of HAN, FAN/AMI, WAN & LAN (the blue dotted lines). The software to manage this amount of data processing will be cumbersome and introduce major new security risks. Electricity is mostly billed by the kWh. However, the cost of providing this energy is based on many things, including these heavy dynamics of the system. In other words, the Grid companies are operating a business where their clients are not billed according to the costs. They have somehow managed to operate this way for years. Now, the public, the government and lots of scientists are telling them that they need to encourage their clients to use less energy. This means they are told to introduce a marketing program that reduces their sales. In addition, they are told to promote compact fluorescent lighting, which further reduces the lighting component of their sales by a factor of 6 to 1. On top of that, the CFL lights have a power factor of .53 which means it costs about twice as much per kW to provide the infrastructure to power those lights. In addition to increased infrastructure cost the low power factor means there is an increase in transmission loss which the grid company has to make up for at its own cost. Usually, the total grid transmission loss is about 12% which means, in the case of .53 power factor CFL’s, that they have to burn 31% more coal (at their own cost) just because of the power factor. Computers generally have a power factor of between .6 and .7 meaning they have to burn 13% to 18% more coal. Then, they are asked to integrate Renewable Energy like solar and wind and told to double the accounting load as they keep track of buying and selling RE. Since the solar and wind output varies with the weather and time of day, as these become significant, the Grid has to absorb the cost of managing these added dynamics which usually means adding more peaker plants. (Peaker plants are essentially jet engines with electrical generators attached to them, usually about 50 MW) The peaker plants are the most expensive way to generate energy, they burn hydrocarbons, pollute and are really going in the opposite direction of what was driving renewable energy in the first place. In addition, as a first step towards implementing the Smart Grid, they are encouraged to install smart meters in every home and office. So, as the Grid is asked to lower sales, while increasing costs, they eventually pass some of these costs on to the customer. What the customers see is they get a smart meter and the next thing they know their power bill goes up and they start to develop a bias against the Grid companies. The Grid companies need a new business plan where they gradually lower sales but lower their costs enough so that their profit increases. 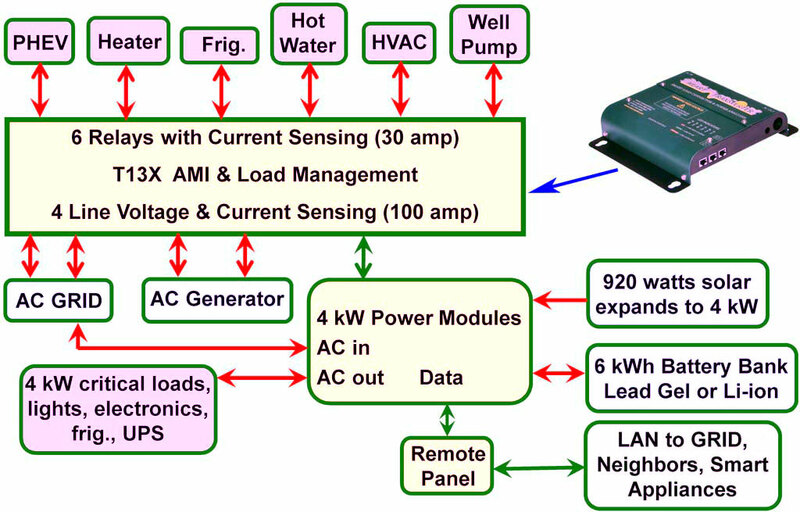 This typical house system includes 4 kW of power modules which power 4 kW of critical loads like lights, refrigerators, electronics and UPS loads like computers. The power modules are also connected to a solar array, a battery bank and to the AC grid. The T13X is a smart load controller that connects to six of the larger loads like the air-conditioner, hot water heater, pump or electric vehicle charger. The T13X also monitors the entire house grid connection. The fact that the house averages 1.7 kW indicates that you don’t really have to run all of the larger loads at the same time. The T13X manages which of the larger loads are on and can guarantee that the total grid current is never above 50 amps. This would allow for cutting the grid service to the house from 100 amps to 50 amps which actually cuts the cost of the electrical infrastructure in half. There is a remote panel that gives the status of everything and includes communication to the computers in the house and connects to the grid and other houses in the neighborhood for coordinated energy management. There is full oscilloscope level analysis of the grid, the six larger loads, the 4 kW of critical loads, the solar panels and the batteries. 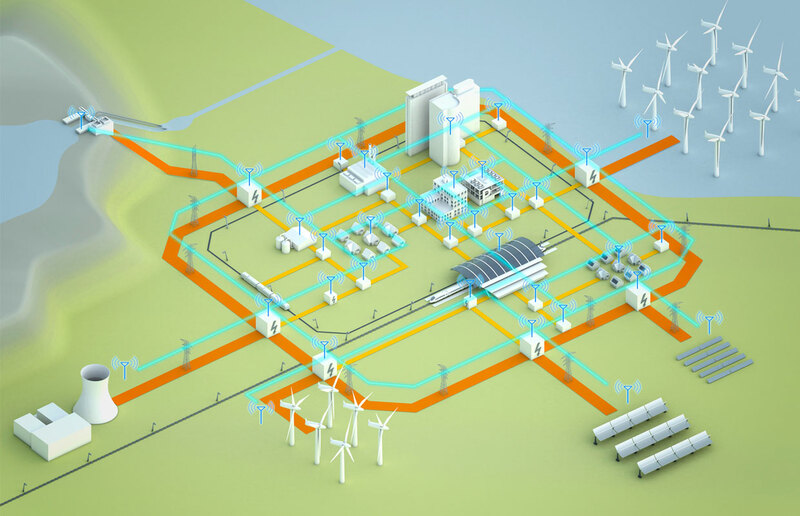 The idea is to have the logic coordinate everything connected to the system for the maximum benefit to the owners, the community and the grid. When the grid fails, the house can run the 4 kW of critical loads from the 6 kWh battery bank combined with whatever solar power is available. This will normally run the critical loads for an entire day and could run the essential loads from the daily solar power indefinitely. This autonomous capability is the key element of energy security. Hardware, wires and other B.O.S. Reduces energy consumption by 20% saving over 23 MWH / month. The smart load controller takes advantage of the hours of the day when the house is unoccupied and reduces major loads by rules and schedules set up by the end user. (Colorado) making a total reduction in power drawn from the grid over 50.6 MWH / month. Solar can be expanded up to 60 MWH / month. This can be added at any time at the customer’s option. The idea is to involve the customer and demonstrate the daily realities of their energy picture which encourages their involvement and provides an easy path for expansion. Automatic surge assist to grid of 400 kW. When inductive motors start they require a surge of several times their normal operating current. Occasionally, a lot of these motors start at the same time and this requires the grid to have substantial reserve capacity to handles these surges. If they do not have enough reserve power active, on line, at the moment of the surge, then the grid voltage sags which causes the inductive motors to draw even more current and the grid crashes. The Transverter power modules automatically supply surge power from the battery bank. This entire surge operation usually only lasts for a few seconds and so has a negligible effect on the energy stored in the batteries or on battery life. Automatic power factor correction to grid of 400 kW. Electronic loads like computers and compact florescent lights do not take current from the grid in a smooth sine wave but take it in very sharp spikes. This phenomenon is measured with a number called power factor which is the amount of the electrical infrastructure, including the power generators, that is actually usable. CFL lighting has a power factor of about .5 and computers have a power factor of between .6 and .7 meaning that these items only can use between 50% and 70% of the electrical system’s capacity. The Transverter power modules correct for this power factor locally so that the grid only sees a power factor of 1 (unity power factor) and so has 100% use of their infrastructure and generator capacity. The 4 kW power modules in each house are more than enough to compensate for all of the CFL and computer loads in one house. This has a significant impact on the total grid transmission loss. In the case of CFL lighting, the Transverter’s power factor compensation cuts the grid’s load by 13% just be reducing transmission loss. 100 amp service → 50 amp service. The automatic load controller combined with the automatic surge assist guarantees that the grid current never exceeds 50 amps. This allows actual downsizing of the entire electrical service to the house including all of the wires and the transformer. This, by itself, does not reduce the average amount of power the grid is providing to an area but it absolutely cuts the cost of the local infrastructure (the actual transformer and wires that connect the house to the grid) in half. It also protects the grid from the freak coincidence of a whole bunch of houses having all of their 100 amps of service loads come on at the same time. The total battery capacity of the 100 house project is 600 kWh which is significant. By setting rules that balance the individual needs with the grid needs this can be used to reduce the dynamics the grid has to handle. This reduces the use of peaker plants and (with enough systems) could eliminate their need altogether. Each home can operate autonomously when there is a grid failure. The 6 kWh of batteries combined with solar will power the critical loads for a typical day and could power essential loads like refrigeration , lights, communications, etc. indefinitely. The social impact of most houses and small offices having this capability in a disaster like Katrina would be enormous. Real time information and datalogging. The remote panel gives all of the important energy information to the users so they always know the true balance of their energy usage and capabilities. This interfaces to their computers for more in-depth graphical analysis and control and can communicate to other houses nearby and to the grid to coordinate energy decisions and priorities. The automatic datalogger documents the effectiveness and ROI of each individual house and, when combined, of the entire project. Turns the whole project into a laboratory. Each circuit of each house creates detailed mathematical models of everything in the system and can communicate these either in real time or as summaries to the research and development labs of anyone designing batteries, solar panels, smart grid systems or anything in the electrical power sector. This will be an enormous free stimulus to developing new energy solutions. There is a PACE financing system already active in many states where loans are made for systems reducing energy taken from the grid by over 20%. These are added to the value of the house and paid back through increased property taxes. That way it does not involve the person’s individual credit and automatically goes with the house if the house is sold. Because this system delivers so much value to the grid, the individual and the community, creative financing schemes could emerge where all three entities share the burden. 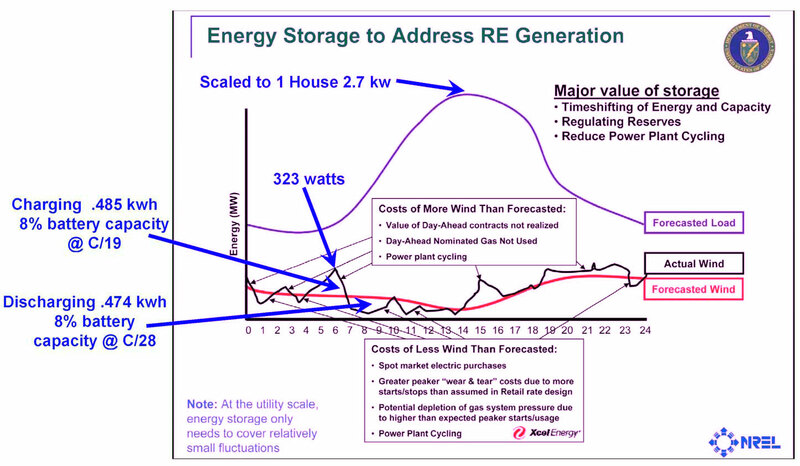 This is a graph NREL made to demonstrate the power use for an entire grid sector for one day. The red line is the forecast wind power based on the previous day’s performance. The black line is the actual wind power that was provided. Xcel Energy (a major grid provider in the Midwest) has put notes listing all of the ways it costs them more money, both when the wind puts out more than expected, and when it puts out less. Notice that when it puts out less they list greater peaker plant costs. The blue arrows are for scaling this to one house. You can see that the biggest peak in surplus wind power is only 323 watts. If the Transverter power modules automatically charge the battery when there is surplus wind energy and discharge the battery when the wind is less than expected then it would only require less than ½ of a kWh to totally neutralize the wind’s fluctuations and completely remove all of Xcel’s extra costs. This is only cycling 8% of the battery’s capacity and doing it at rates under C/19 which is totally feasible for gel cell lead acid batteries and you could expect very long battery life. This would require communication with the grid but it could be slow, like one update every few minutes. Also, notice that a lot of the peak hours are at times when a house is the most likely to be unoccupied while people are at work. This is when the smart load controller could have its maximum impact. Also, notice that between 7:00 pm and 7:00 am there is not so much power drawn which would be an ideal time to charge electric vehicles. This picture has lithium ion batteries that use cells that are identical to the ones being developed for electric vehicles. They have special embedded electronics to enhance performance and reliability and have a demonstrated life of over 10,000 cycles. They are currently available for about $1,000 per kWh but, as the electric vehicle market evolves, their price should come down to $500 per kWh or less. Currently, high quality lead acid gel cells are about $250 per kWh. As a point of reference, the Chevy Volt plug in hybrid has 16 kWh of Li-ion batteries. This picture is from a community storage installation in San Francisco done by Growing Energy Labs. The Transverter power modules are based on mathematical models of the batteries and can automatically adapt to any chemistry of battery available today or any type of battery that will be developed in the future. This is the same 24 hour load profile from the previous NREL graph with it scaled to one house. We have calculated the optimum size of solar array to help balance this use pattern (in this case 1.84 kW of solar which is 8 of the 230 watt panels. You can see the difference between what is used in the house and what is produced by the solar with the green line. If we charge the batteries when the green line falls below the average and discharge when the green line is above the average then the net effect to the grid is the completely flat line of the average. Aside from alleviating the burden of using peaker plants to deal with peak loads this has a significant effect on grid transmission loss which is usually about 13%. Just adding this solar (without the battery balancing) removes 11% of the transmission losses and the solar combined with the battery balancing reduces the grid’s transmission losses by 57%. This would only require communication with the grid once a day. This requires daily charge-discharge cycles of 3.9 kWh which is clearly out of the range of what you can realistically expect from lead acid batteries but is totally reasonable for the Li-ion batteries. This would add $4,500 to the cost of the system at today’s prices but that should drop to about $2.000 in the near future. This totally achieves the dream of the ideal house with the constant average power drawn from the grid with no dynamics. All this without selling any power to the grid or any equipment outside the house. This is a similar graph for the entire state of California for last July 8th. It has been scaled for one house. The optimum solar array to balance this load profile turns out to be 920 watts which is exactly half of what is in the example one house system described earlier. Just adding this solar (without the battery balancing) removes 6% of the transmission losses and the solar combined with the battery balancing reduces the grid’s transmission losses by 31%. This example has 15% of the energy coming from solar. This, when combined with the renewable energy sources the grid already has, would make California’s goal of 20% renewable energy easily obtainable. Again, the discharge cycles are similar which mandates going to Li-ion batteries. There are no projects proposed which have anywhere near this level of impact on the cost of providing electrical power to houses and offices. This is all done with a minimal of communication to the grid, no special billing or permits and nothing installed outside of the home and office. Engage the individual home owners while substantially lowering their power bills. Reduce the grids actual cost to provide each kWh. Lower the cost of the electrical infrastructure. Integrate Renewable Energy for the lowest possible cost with the highest stability. Provide individual house and office autonomous energy security. Provide Smart Grid benefits to the homes and the grid companies while minimizing the data processing burden. Create a real test bed environment for Smart Grid software developers. Provide a state of the art energy lab for every “2 guys in a garage”. What we are proposing is the real smart grid, one house at a time, providing autonomous smart nodes, implementable today, integrated Renewable Energy, demand response, data acquisition, advanced metering, end to end communications, power quality control, energy security, community energy storage, a living system, evolving and adding applications over time. There is nothing else that has been proposed which comes close to these benefits, particularly considering that this can be implemented immediately for a minimal cost that can easily be financed. These project are referenced in the Smart Grid Information Clearinghouse SGIC. Help support this project by going to the GE Eco Challenge and registering and voting. For concrete examples of real systems go to Microgrid and read this detailed paper Transverters for Residential Solar & Microgrids.